New York’s Empire State building was lit up in red and purple Tuesday in honor of more than 200 Nigerian girls kidnapped by Boko Haram militants one year ago. The edifice was to remain illuminated until 2:00 am (0600 GMT), a nod to the number of girls who remain missing. Candlelight vigils, rallies and prayers were held from Nigeria to New Zealand to Paris to mark one year since the girls were kidnapped, while others commemorated the missing students and demanded their safe return with #BringBackOurGirls messages. 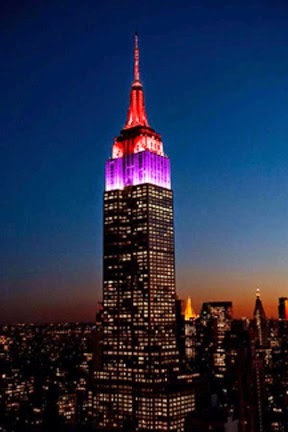 “On Tuesday, April 14, 2015, The Empire State Building will be lit Purple and red in honor of BringBackOurGirls,” the Empire State website said. Some 276 girls were taken from the northeastern town of Chibok by the Boko Haram extremists, 219 of which remain missing. Amnesty International said the Chibok girls’ kidnapping was one of 38 in northeast Nigeria since the start of last year that had seen at least 2,000 women taken by the militants. Nigeria’s president-elect Muhammadu Buhari on Tuesday cautioned he could not make promises on the return of the 219 missing schoolgirls.